“There are no tickets or reservations. You just show up. The doors are open to you. Some of the sites might have lines,” said Caroline Stevens, program director of Doors Open RI. “This is very much a community event, so every site we view as the start of a relationship between the people of Providence and these places.” The festival runs 10am – 6pm, although most individual sites have slightly more limited hours. (There is also a special evening program at Aurora.) RIPTA is providing free bus service for attendees to access multiple sites without worries about cars and parking, and sites will have passes or wearable buttons to facilitate this. “This program is not just about architecture, but what makes Providence the remarkable city that it is, which is art, culture, and history, all of these things,” Steven said. Annmary Brown Memorial: on the left is the entrance to the mausoleum containing the remains of Rush Hawkins and Annmary Brown Hawkins; on the right is a painting by Edwin Lord Weeks showing the Sikh Golden Temple at Amritsar. Rush Hawkins was a colonel on the Union side in the Civil War, and according to Harrington was promoted to the rank of general shortly after the end of the war. Harrington said that Hawkins’ military career ended when he sent a letter to President Abraham Lincoln criticizing General George McClellan for his notorious reluctance to fight; Lincoln later conceded to Hawkins, Harrington said, that the criticism was valid. One of the more interesting artifacts is a large box with a note on the outside in Mr. Hawkins’ handwriting saying the contents are the letters exchanged almost daily by the couple during the war and asking that they be destroyed to preserve privacy – and the box is empty. 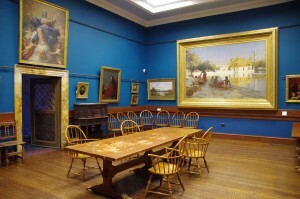 Sites available to visit range from places usually not accessible to the public, such as the studios of RI Public Radio (noon – 6pm, handicap accessible), 1 Union Station, to less accessible places within otherwise accessible places, such as the history of printing room at the Providence Public Library (9:30am – 2pm, handicap accessible), 225 Washington St, with old printing presses, type cases, and type specimen books. Some are difficult to access without special arrangements, such as the Benefit Street Arsenal (10am – 6pm), 176 Benefit St, a small medieval-style castle built in 1842 in the Dorr War era and now home to the Providence Marine Corps of Artillery, containing Civil War artifacts. Several sites focus on the history of the city. The Episcopal Cathedral of St. John (noon – 6pm), 276 North Main St, has been vacant for many years but visitors can see its new life as the Center for Reconciliation, a museum focused on race and the local slave trade. The Roman Catholic Cathedral of Saints Peter and Paul (10am – 4pm, handicap accessible), 30 Fenner St, is a classic Gothic Revival structure that faces the nearly-forgotten Cathedral Square plaza designed by internationally renowned architect I.M. Pei, and the cathedral itself is the surviving twin with the Cathedral of St. Joseph in Hartford, CT, both completed in 1889 but the latter destroyed by fire in 1956. Government buildings have often overlooked interior spaces, such as the attic archives of Providence City Hall (10am – 6pm), 25 Dorrance St, even containing old police mug shots. The Rhode Island State House (10am – 6pm, handicap accessible), 82 Smith St, featuring what is believed to be the fourth largest self-supporting dome in the world (St. Peter’s Basilica in Rome and the Taj Mahal in India are first and second on that list), was completed in 1904 on a design by architects McKim, Mead and White – the latter of whom, Stanford White, was the victim of “the murder of the century” in 1906 by the jealous husband of Evelyn Nesbitt, “the girl in the red velvet swing.” A special exhibit on the Gaspee affair will be part of the State House tour, Stevens said. More directly involved in murder, the Victorian-era Barnaby Castle (10am – 3pm, handicap accessible), 299 Broadway, was owned by Josephine Barnaby who became the victim of the first known instance of murder by mail when she drank a gift of whiskey laced with arsenic; a contentious trial produced a conviction that was overturned on appeal and ended inconclusively with the death of the defendant, a story told in some detail by Mrs. Barnaby’s great-grandson Conrad Barnaby in his 1983 book, A Revolting Transaction. Associated with crime of a very different sort, Hudson Furs (10am – 4pm), 101 Cranston St, was the scene of the Bonded Vault Robbery in 1975, when Mafia-connected robbers stole tens of millions of dollars in cash, gold, jewels and other loot stored by other mobsters in one of the largest thefts in American history. A few entirely new spaces within existing spaces invite visitors, including the grand opening of the new pavilion at Grace Episcopal Church (10am – 5pm, handicap accessible), 300 Westminster St, a “light-filled modern complement to the nation’s first asymmetrical Gothic Revival church” built in 1846 and featuring a Tiffany stained-glass window. Visitors will be given the rare opportunity to tour the interior of the iconic copper dome 100 feet above street level at Beneficent Congregational Church (10am – 4pm), 300 Weybosset St. The John Brown House (10am – 4pm), 52 Power St, was built in 1788 by an influential and wealthy politician and slave trader. The Stephen Hopkins House (10am – 9:30pm), 15 Hopkins St, built in 1707 is the oldest house in Providence (although twice relocated) and was the home of the signer of the Declaration of Independence, 10-term governor (when the term was only one year), and host to George Washington who visited twice. 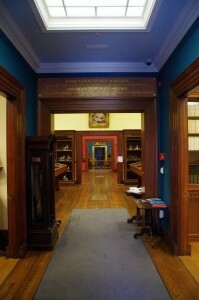 The RISD Naure Lab (10am-4pm, handicap accessible), 13 Waterman St, has more than 80,000 specimens and explores the connection between nature and art. The RISD Textile Lab (10am – 2pm), 7 North Main St – Metcalf Bldg, features a working, modernized, industrial Jacquard loom. 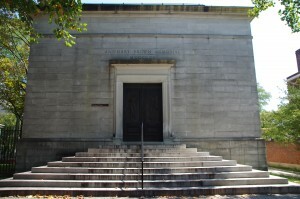 Ladd Observatory (11am – 3pm, handicap accessible), 210 Doyle Ave, was frequented by amateur astronomy enthusiast H.P. Lovecraft and has much of its original equipment intact from the 19th and early 20th Centuries; solar observing will be available if the weather co-operates. The Columbus Theater (10am – 4pm), 270 Broadway, started in 1926 as a vaudeville venue and now hosts films and live performances. Atlantic Mills (10am – 4pm), 120 Manton Ave, is a commercial building a century-and-a-half old that was a factory before labor laws existed, but how holds a variety of for-profit business, non-profit organizations such as the archives and collection of the Retro Computer Society, and a well known flea market. The Arcade (10am – 3pm, handicap accessible), 130 Westminster St, built in 1828, is generally believed to be the first shopping mall, and is now a mixed-use combination of businesses on the lower floors and micro-living loft spaces on the upper floors. Aurora, 276 Westminster St, will host a special evening event, “19th Century Providence in 3D,” a 45-minute stereopticon presentation by historian Ned Connors, with three shows beginning, respectively, at 5pm, 6:15pm, and 7:30pm; a cash bar will be available. 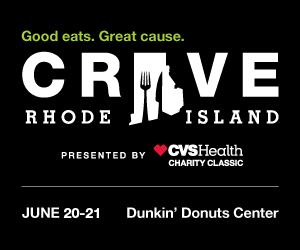 This is the organization’s first citywide festival in Providence, Stevens said, and she is hoping for about 2,500 visitors throughout the day-long event. “It just depends upon how many people find out about it and what the weather is like,” Stevens said. “This is part of a worldwide network of these events. Part of how I got the number 2,500 is Doors Open Lowell [MA] has been going on for over a decade and they get 2,500 people, but over three days… Providence is a slightly bigger city, so maybe we’ll get 2,500 for the day. When I ran this program in Chicago, now they’ve expanded to 200 sites for 100,000 visitors, so I can’t compare what’s happening here in Providence to that.” A Doors Open RI event in June at the historic Congregation Sons of Jacob Synagogue in the North End of Providence, the turn-of-the-century center of Jewish life in the state, drew 400 people, Stevens said, but it will not be part of the festival because it is being held on a Saturday.